I’m sure you all think I eat things like cheese steaks on a regular basis, but up until Phil’s Steaks launched its truck and started parking down here, our only options in the Financial District for this marriage of meat, cheese and bread was Carl’s Steaks (which isn’t even in the FiDi) or one of the varieties from street meat carts and delis that I’d just rather not chance. The only other time I’ve had one of these was in Philadelphia and it was so unmemorable that I can’t even remember where I got it from. When the truck first launched, I had no time to stand in the long lines, and instead we got a take from some dedicated lunch’ers who did. One day last week I walked by and saw that the line seemed to be moving quickly, so I jumped in to see what all of the fuss on Twitter about these sandwiches is about. 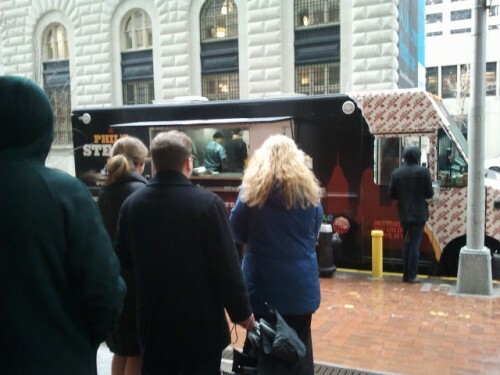 Posted by Andrea H at 10:30 am, April 2nd, 2012 under Cheesesteak, Phil's Steaks Truck, Sandwiches, Truck. 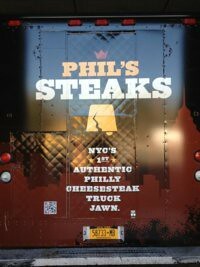 As you may have heard, people are really into this truck called Phil’s Steaks which aims to school us New Yorkers on what a Philly cheesesteak should actually look/taste like. They use bread from Philly and poached some of their staff from Philly. But how are the sandwiches once you get past the hype? We’ve already gotten a take from Rachel when the truck parked in Midtown and she generally said it was good, and straight ahead are what a couple of Downtown Lunch’ers thought, as well as the menu. 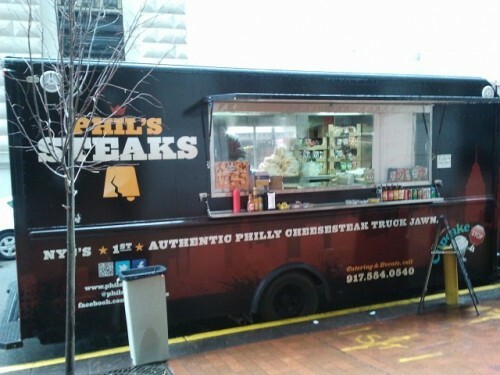 Posted by Andrea H at 12:00 pm, February 17th, 2012 under Cheesesteak, Phil's Steaks Truck, Sandwiches, Truck. Phil’s Steaks was supposed to debut in the Financial District a month ago, but instead took some time off to perfect their craft. They were on Old Slip & Front today and despite the cold and rainy conditions, a sizeable line was in effect for lunch although you couldn’t tell until getting closer as people were standing under the overhang of the building in front of the truck. I did not have time to stand in that line, but check back tomorrow for a take from one Downtown Lunch’er who did. And leave your impressions in the comments! Posted by Andrea H at 1:45 pm, February 16th, 2012 under Phil's Steaks Truck. There aren’t a lot of good sources of Philly cheesesteaks in the Financial District or any part of lower Manhattan other than Carl’s Steaks on Chambers St., and no, those things you get from the halal vendors aren’t the real thing. 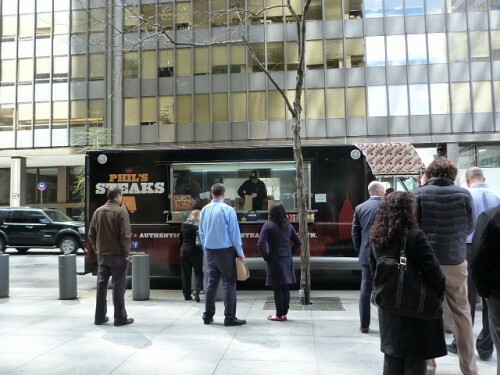 A new truck called Phil’s Steaks is parking in the FiDi today was supposed to come to the FiDi today, but isn’t on the road at all. Although they haven’t been reviewed yet on the Midtown side of the site, it seems like they’re legit and sourcing bread from Philly, etc. A full sandwich is $8.50 or you can get a half for $5.50, and they offer beef or chicken with all of the fixings. There are also some sort of combo meals offered but I can’t find out online what exactly those are. If any of you check it out for lunch, let us know how it was in the comments! Posted by Andrea H at 9:30 am, January 20th, 2012 under Phil's Steaks Truck.